Tomorrow at the Foxwoods December Mega Stack Challenge, we have a new event kicking off at 11am. The $230 No-Limit Hold 'em Re-Entry features 15,000 chip starting stacks with 25 minute levels. There is a $20,000 guaranteed prize pool on this event. This is a one-day event. Day 2 of the $300 No-Limit Hold 'em $100,000 guaranteed event will resume at noon and play to a winner. We will be live streaming all of the Day 2 action starting at noon. Players in the $300 No-Limit Hold 'em Mega Stack Challenge event have just started Level 15 with the blinds now at 1,200-2,400 with a 400 ante. 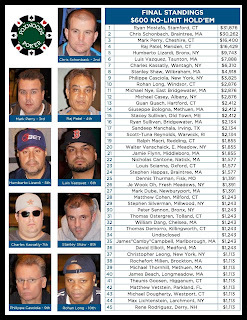 With 144 of the original 555 entrants still alive, the average chip stack is now 57,400. Play will continue today until the conclusion of Level 22. The final 63 players will finish in the money. We had a total of 555 entrants in the $300 No-Limit Hold 'em Foxwoods Mega Stack Challenge. 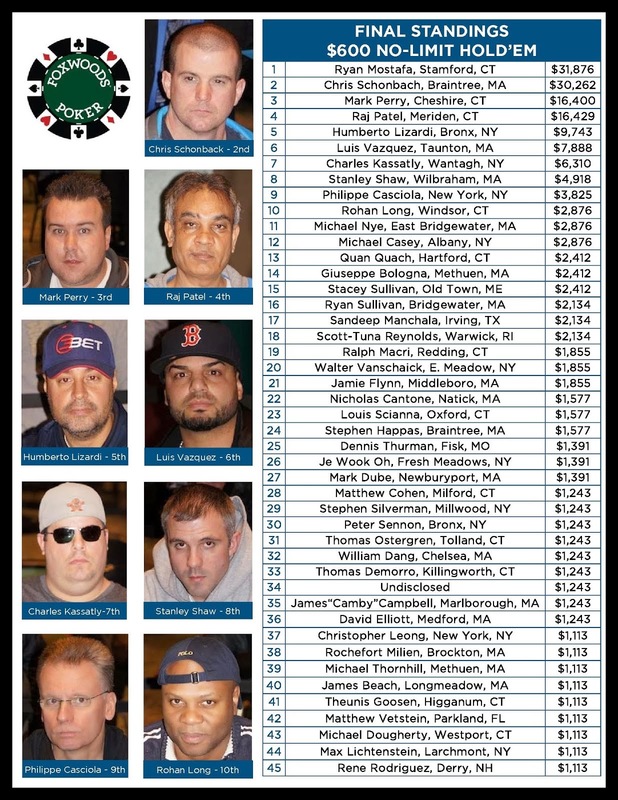 The final 63 spots will finish in the money with first place taking home $27,995. Over 450 Entrants Already in the $300 NLHE $100K GTD Mega Stack Challenge! 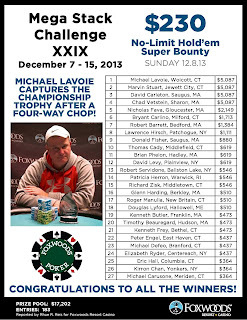 Level 4 of the $300 No-Limit Hold 'em event at the Foxwoods December Mega Stack Challenge has just got underway. There are currently 466 entrants in today's event with registration and re-entry open until the end of Level 6. This event featured a $100,000 guaranteed prize pool, which has already been exceeded. 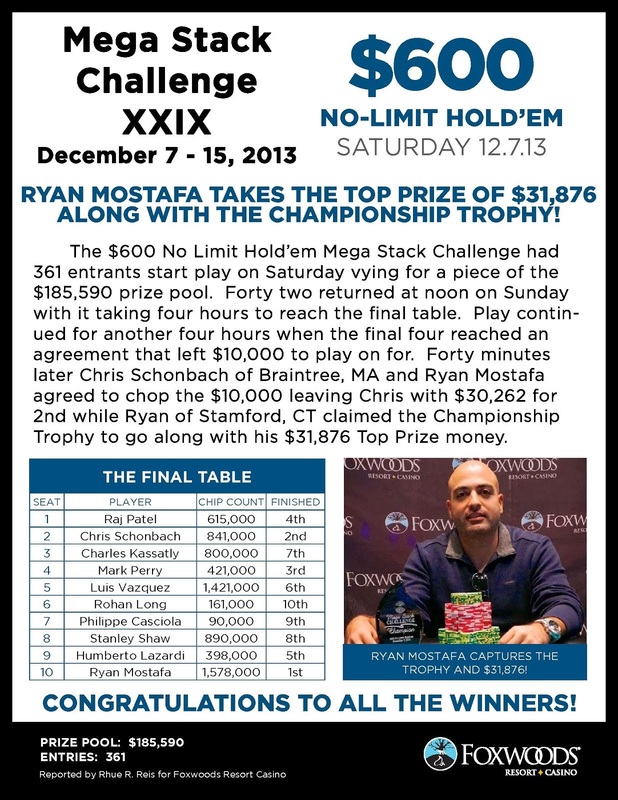 The $300 No-Limit Hold 'em event at the Foxwoods December Mega Stack Challenge is now underway. Players start with 15,000 in chips and all levels will be 30-minutes in length. Registration and re-entry for this event will remain open through the end of Level 6. This event features a $100,000 guaranteed prize pool. Michael Lavoie Wins the $230 No-Limit Hold 'em Bounty Event! The final four players in the $230 No-Limit Hold 'em Bounty event decided to chop evenly four ways and play it out for the title. 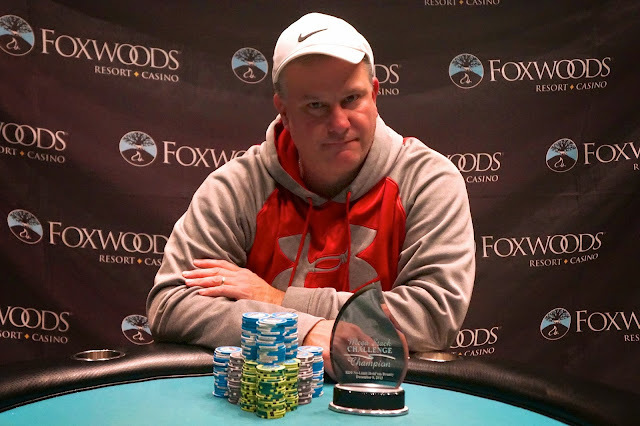 In the end, Michael Lavoie came out victorious, earning $5,087 and the Mega Stack Championship trophy. 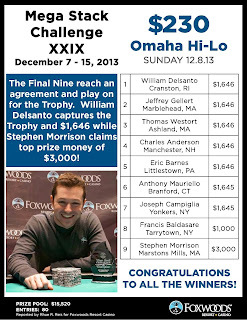 William Delsanto Wins the $230 Omaha Hi-Lo Eight-or-Better Event! 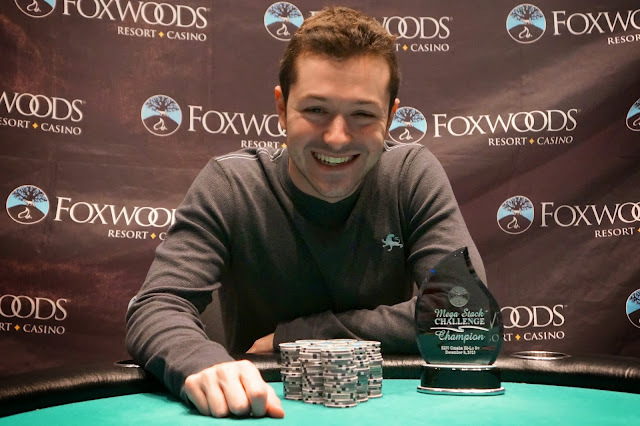 The final seven players in the $230 Omaha Hi-Lo Eight-or-Better event at the Foxwoods December Mega Stack Challenge have come to an agreement on a even chop. 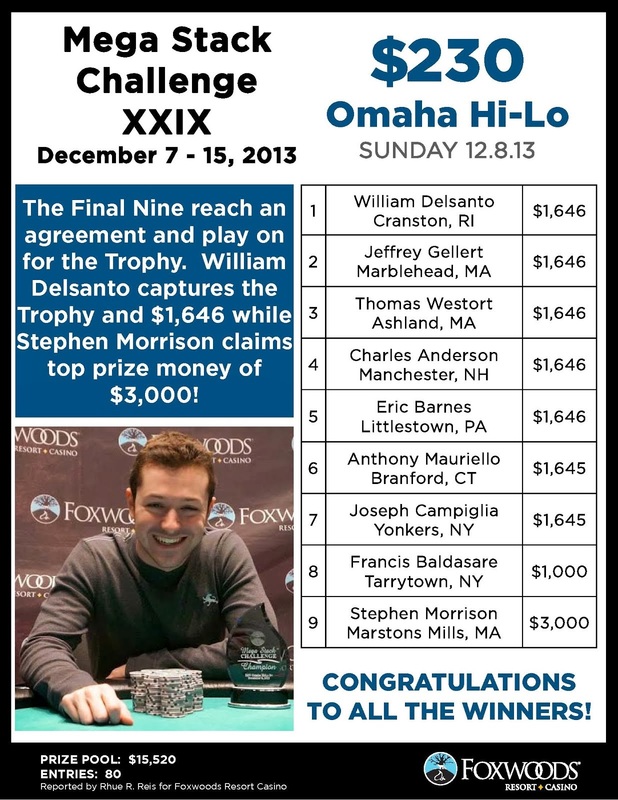 William Delsanto held the chip lead when the deal was struck and is officially the winner of the event. 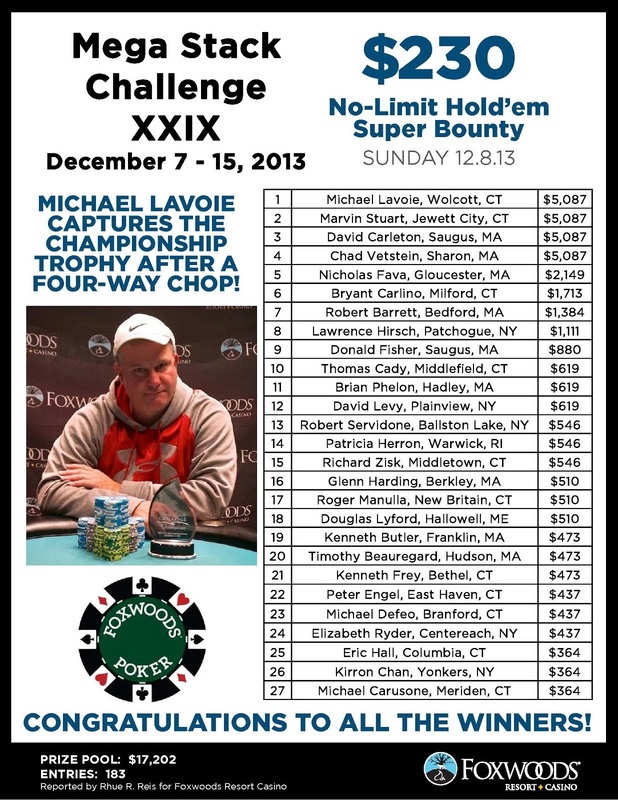 He takes home $1,646 as well as the Mega Stack Challenge trophy!